(Photo: WCC / Joanna Lindén-Montes)World Council of Churches general secretary, Rev. Olav Fykse Tveit, and the moderator, Rev. Walter Altmann, who both delivered reports on the ecumenical movement on the opening day of the WCC 10th assembly in Busan, South Korea on October 30, 2013. 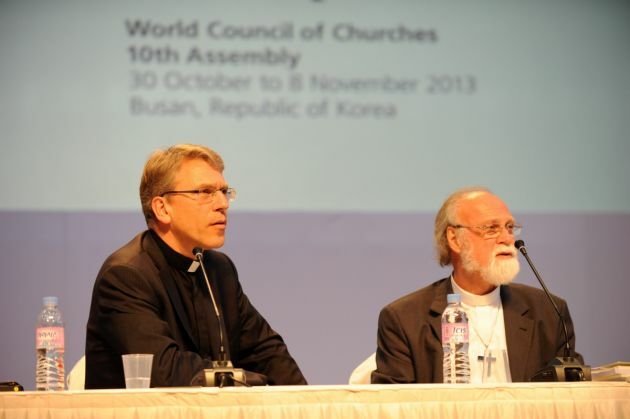 BUSAN, South Korea - A key leader in the World Council of Churches has urged its members to note the shifting "center of gravity" in global Christianity and the influence of secularism as contributing to waning interest in religion in Western countries. The Rev. Walter Altmann, moderator of the World Council of Churches, spoke out on the global religious landscape during a speech in front of the 10th WCC Assembly gathering in Busan, South Korea on its first day Wednesday. Reporting to the Assembly of the global churches body that runs to November 8, Altmann said, "It is clear that the WCC is today less representative of world Christianity than it was when it was founded, or at least than in 1961 when the WCC welcomed the affiliation of many Orthodox churches." Commenting on the economic crises faced internationally, Altmann addressed the hardships affecting large communities around the world. These hardships have affected church bodies and also the World Council of Churches with some 560 million members. A Brazilian Lutheran, Altmann acknowledged the changing climate of global Christianity. 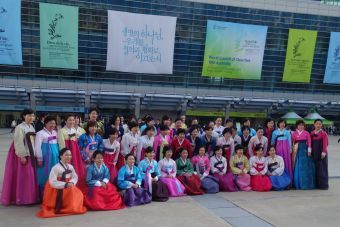 (Photo: Ecumenical News / Peter Kenny)Korean women gather for a photo just before the start of the World Council of Churches 10th Assembly in Busan, South Korea on October 30, 2013. "With regard to Christianity, our attention is drawn to the progressive shift of Christianity's center of gravity to the East and to the South. "There is a decline in the number of Christians in many Western countries, particularly in Europe, with consequent withdrawal of significant portions of the population from religious institutions due to the continuous process of secularization." Citing an atheistic education as a problem contributing to the mobility of belief out of Western countries, Altmann also acknowledged conflicts afflicting the Middle East as reasons for a diminished Christian population in that area. Altmann called this a "cause for profound concern." "An assembly like this one is also a highly auspicious and needed occasion to restate the ecumenical goal of the churches, a goal that is even more urgent when one looks at the current fragmentation of Christianity." Altmann recognized the booming Pentecostal church and its insufficient representation in this year's World Council of Churches assembly. He hoped this is rectified soon as many Pentecostal churches are showing interest in WCC membership.